The reason behind our view is the recent stimulus in China. The monetary and fiscal stimuli started in December and we see the effects now. Credit growth exceeded all estimates in March, and the manufacturing sector unexpectedly return to growth, while service sector activity accelerated. Importantly, last month, Beijing announced billions of dollars in additional tax cuts and infrastructure spending on top of measures last year. So, even if we do not see a return of a boom, the current global slowdown is not likely to morph into a recession. Whether gold bulls like it or not. Another important factor here is the shift away from tighter monetary policy by central banks. In particular, the Fed has changed its view that low unemployment rate will have to spur inflation – rather, due to global competition and technological progress, low inflation rate may stay with us for longer, so there is no need for aggressive tightening. A more dovish Fed – and the resulting downward pressure on the real interest rates and the US dollar – should support the gold prices. Moreover, trade tensions has somewhat eased – at the Spring Meeting of World Bank and the IMF, U.S. Treasury Secretary Steven Mnuchin said that he was hopeful the U.S. and China are “close to the final round” of trade talks. Last but not least, the EU has postponed the deadline for Brexit until the end of October, raising the odds of orderly divorce. And the British politicians seem to be approaching the customs union compromise, which would not be as harmful as the hard Brexit. If these two big risks – i.e., full-blown trade war and chaotic exit of the UK without a deal – don’t materialize, the risk appetite among investors may increase, which could hit the safe havens such as gold. The key message from the IMF’s Spring Meeting and its recent World Economic Outlook is that there will be a significant growth slowdown this year. However, some of the idiosyncratic factors and uncertainties weighing on growth are waning, while central banks and government are adopting more accommodative policies. Here, we expect the current slowdown to be temporary and followed by a rebound in the second half of the year. What does it imply for gold? Well, the slowdown combined with a more dovish Fed are key factors which could make 2019 a better year for gold than 2018. The rebound in growth could be, conversely, negative for the gold prices. However, although the US GDP might accelerate later this year, the pace of economic expansion is projected to be slower than last year when fiscal stimulus spurred growth. And the IMF forecasts it to decline further in 2020, as the chart below shows. The convergence between the US and Europe’s economies should ease the upward pressure on greenback and support gold. 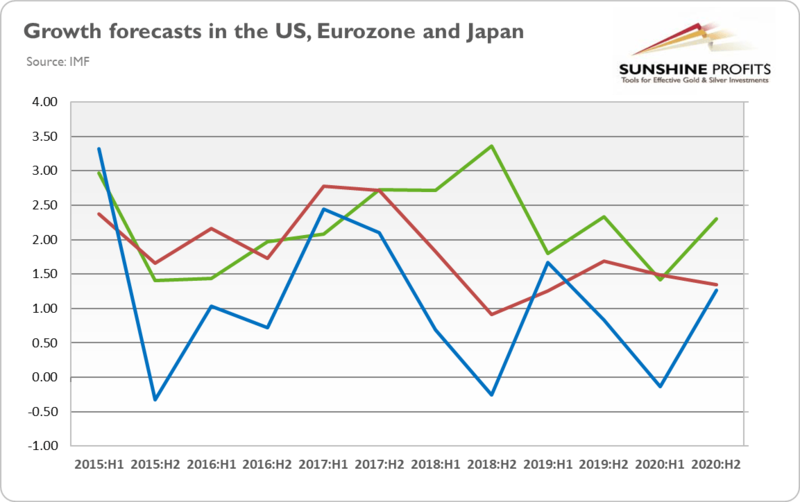 Chart 1: Half-yearly growth forecasts (annualized semiannual % change) for the US (green line), Eurozone (red line) and Japan (blue line) from H1 2015 to H2 2020. Indeed, if we see a revival in the Eurozone, the euro may strengthen against the greenback, which would also be supportive for the gold prices. After all, the current slowdown did not make the yellow metal to rally because it was concentrated mainly in Europe.